Beware of counterfeit Prince/Associated Artist releases! Forums > The Marketplace: For Sale/Trade > Beware of counterfeit Prince/Associated Artist releases! In recent years, as various Prince and associated artist albums have gone out of print, counterfeiters have stepped in to fill a gap in the market by producing unauthorized copies of these now-rare collectibles. The problem is especially acute for out-of-print compact discs, although some vinyl albums have been counterfeited as well. Some of the counterfeit CDs look very professional, and it can be difficult to tell them apart from genuine CDs. Counterfeits are regularly found on websites such as Amazon.com and eBay, and even in brick-and-mortar record stores, so it is possible that you already own one without even knowing it is a counterfeit. Some of the counterfeits are sold for high prices, and you may be surprised--as I was at one point--that someone can charge $100 or more for a counterfeit CD today when the genuine article was available at some point for a regular retail price. For some albums, the CD versions are much, much rarer than the vinyl, because they were issued at a time when few people had CD players and went out of print after a short run. Before buying any out-of-print Prince or associated artist CD, whether on this forum or elsewhere, you should consider the possibility that it may be a counterfeit. Do some research to find out what countries (if any) saw an official release and what prices an official release might command in today's market. If it looks like you're getting an amazing deal, you're probably buying a counterfeit, unless you're dealing with someone who doesn't know the article's value (and that's unlikely to happen online). If the CD was only issued in Japan and/or Europe, and the copy you're being offered is supposedly from the U.S. or some other country, it's a counterfeit. You may wish to ask the seller to compare the CD and its matrix numbers to images of known fakes. You also have the right to ask about the seller's return policy, when and where the seller acquired the item, and whether the seller will guarantee the item's authenticity. In addition, if you encounter a counterfeit CD that has not yet been discussed on these threads, please reply to this thread so that the fake can be documented, and include images if possible. This will help the community keep track of which albums have been counterfeited and how to avoid the fakes. It is unfortunate that some unscrupulous individuals are profiting from the work of musicians whose art they did not help to create. The best way we can fight this is to raise awareness of the problem and make accurate information available. Always give credit to people or sources cited. 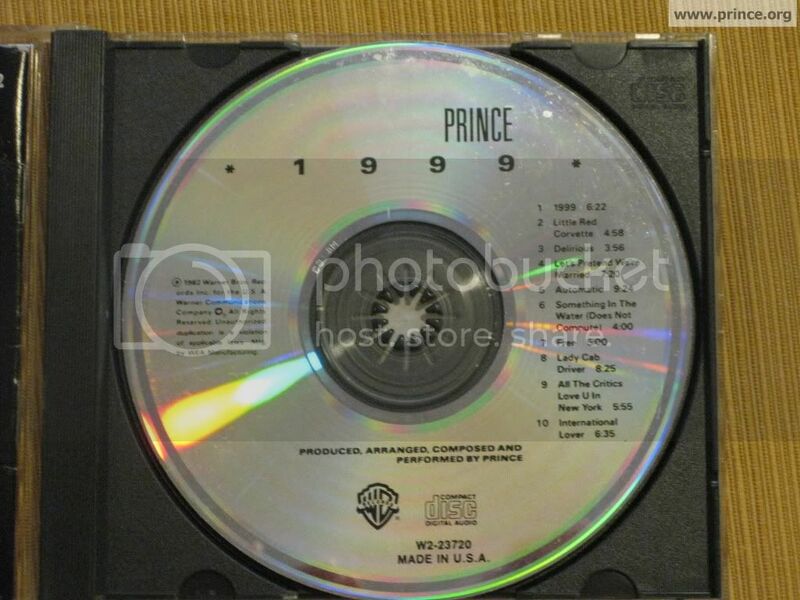 I have used my copy of Prince's 1999 because it is common enough that this image would be of no use to counterfeiters, but there are some features common to most if not all genuine Warner Brothers CDs pressed for the U.S. market during this period. (European and Japanese pressings are different.) The most important features to note are the two shiny mirror bands, one around the center of the disc and the other around the edge. The one around the center contains the matrix numbers, which are often key to identifying fakes. Note also the black jewel box case with the "Compact Disc" logo in the top right corner. 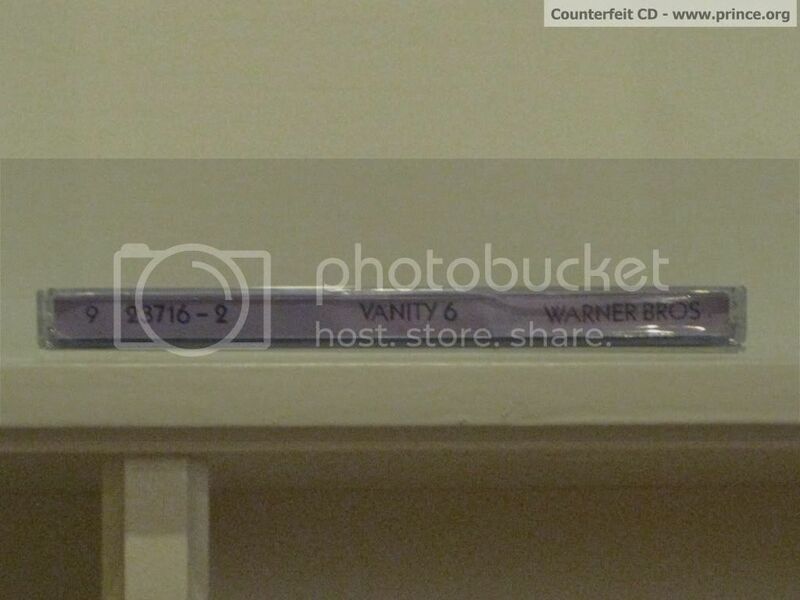 In the photo of the spine, note the uneven lettering of "Vanity 6." The counterfeiter is trying to replicate the original font but can't do so precisely. The actual cover of the counterfeit looks about as blurry and faded as it does in this photo. 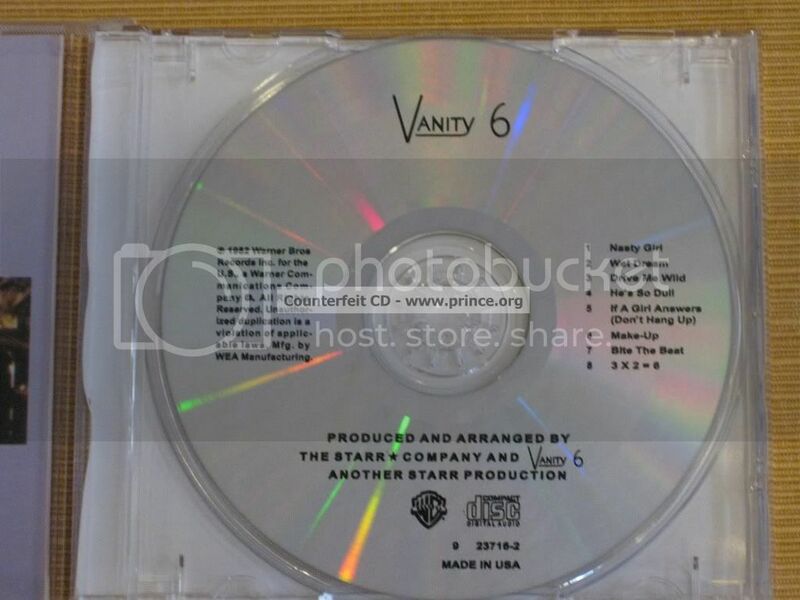 The cover of a genuine Vanity 6 CD is much sharper. I have a genuine copy but will not post the images here as it might help the counterfeiters out. Overall, if you know what to look for, it would be easy to identify this as a fake. But if you aren't expecting to find a counterfeit on Amazon (as I wasn't), you could be fooled. This site makes it sound like Musicology and 3121 were legally released as promo vinyls, but I heard from everyone here that they were both fake. Does anybody know for sure about this? That's a good question. I have both albums on vinyl and thought they were legit promos. Just grabbed a copy of Romance 1600 from an Amazon seller and, perhaps it's just because this thread is in my head, but I'm suspicious of it. Does anyone know if people have bothered to counterfeit these discs too? The print quality of the liners is rather bad, the paper feels flimsy, and strangely, the liner notes are very loose in the case, as if they have been cut a few millimeters too short. The very tip top of Sheila's hairdo (as well as the very top little teardrop dot of the little design behind the word "Sheila" on the cover) is cut off as a result! The disc seems very close, and actually looks almost identical to the copy on Madhouse Music right now, with the exception of the lack of a "brushed" silver area just inside the outer mirror band. But the bands themselves are there. Does anyone know if there are multiple pressings of the "German" Romance 1600?